To keep pets with their families and reduce the number of abandoned dogs and cats. We accomplish this by distributing pet food to local food pantries which serve New York families in need. Special thanks to The Mayor's Alliance, Rescue Bank, Long Island Cares and Food Bank For New York City for their continued support of ARF! and its mission. Everyone jumped into action when Hurricane Sandy hit, and ARF! was able to direct pet food to where it was most needed. ARF! will continue to get pet food to the Hurricane Sandy victims for as long as they need help. And a very special thank you to Carrie Essenfeld, ARF! social media director and all-around great person for her invaluable help spreading the word about ARF! ARF! celebrated its fourth anniversary in November, 2012. Four years ago, New York pet owners in need had no place to turn to get help feeding their dogs and cats. ARF! 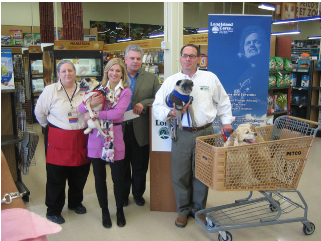 changed that, and we have come a long way, with metropolitan area food banks and local food pantries now recognizing that pets are an integral part of the families they help - low income families, the unemployed, people suffering from disabilities and chronic illness, and senior citizens. Social service organizations now know what all pet owners know - our dogs and cats are part of our support system, especially in hard times. And keeping pet-owning families together is how we accomplish our mission. We have gone from delivering bags of pet food to the Yorkville Common Pantry to having pallets of food delivered to Long Island Cares (serving Nassau and Suffolk Counties) and Food Bank For New York City (serving the 5 boroughs). ARF! has worked with The Mayor's Alliance for NYC's Animals, Rescue Bank, the ASPCA, PETCO, many local NYC pet food stores and pet food distributors, schools, scout troops and animal-related organizations to organize pet food drives and to collect pet food. ARF! 's progress has been publicized in the New York Daily News, the New York Post, WCBS Radio and on NY1, where Susan Kaufman was personally honored as New Yorker of the Week for her work with ARF! GREAT NEWS - ARF! is now affiliated with Rescue Bank, an innovative organization based in Houston, TX. Rescue Bank is a food bank for pet food, with extraordinary access to pet food manufacturers and the ability to ship large quantities of pet food. ARF! has been working with Rescue Bank for over a year, which has afforded ARF! the ability to have truckloads of dog and cat food delivered to Long Island Cares and Food Bank For New York City. As ARF's profile grows, more organizations have stepped forward to work with ARF! in accomplishing its mission. ARF! is registered as a 501(c)(3) non-profit organization. Contributions to ARF! are tax-deductible to the extent permitted by law.